Werner Jaisli, a Swiss man who journeyed to Argentina in search of extraterrestrials, built an enormous 'UFO landing pad' in 2008 outside of the small town of Cachi in the province of Salta. Jaisli told Argentinian newspaper El Tribuno that in 2008 he received a telepathic message from extraterrestrials telling him to construct the pad. "They landed about 100 meters above our heads and projected on us a beam of light that made us both see their own brightness," he said. "The funny thing is that it did not affect our vision. Something began to bubble through my brain: it was an order. They asked me telepathically to build the airport." 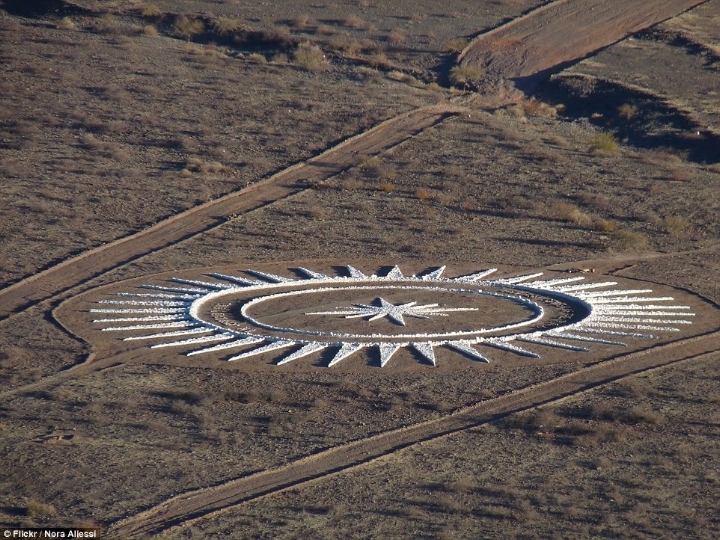 The landing pad, known as an 'ovniport,' is in the shape of a 36-pointed star, measures over 150' in diameter, and is comprised of thousands of white rocks. A second, smaller star was completed in 2012. When asked why he chose this particular configuration, Jaisli responded, "I built it the way they told me to." Jaisli's ovniport quickly became a popular site of pilgrimage for tourists and UFO enthusiasts alike. Werner Jaisli was by all accounts an odd, reclusive man, who sported a long, pointed white beard and dressed in the garb of a "Druid priest." He was often seen wearing "a black jacket with deer antler buttons, a mid-skirt, a toque and...Texan-style boots." In 2011, Jaisli was accused of stealing from the wallets of a visiting Uruguayan couple staying at a nearby hostel. His unique appearance made him easy to identify as the culprit, and when police searched the cave he called home, they found around half of the missing money--$1,828. He spent time in jail for his crime, and once released the nearly 70-year-old Jaisli declared he would be leaving the area, and his UFO landing pad fell to the care of the local municipality. Locals weren't quite sure exactly where Jaisli went after he left Cachi. Some speculated he went home to Switzerland, while others thought he had gone to Bolivia to build a second ovniport; although more than a few locals joked that perhaps he left in the care of the extraterrestrials with which he was so enamored. In 2014 Jaisli was photographed by French photographer Etienne Jeanneret at a bar in Cochabamba, Bolivia. Jeanneret reported that Jaisli said he was in Bolivia to "escape, because he felt threatened in Argentina." There was no mention of a second ovniport, and Jaisli's current whereabouts are unknown.